Four in-depth business studies on the U.S. Navy are currently available from Interna- tional Maritime Associates. 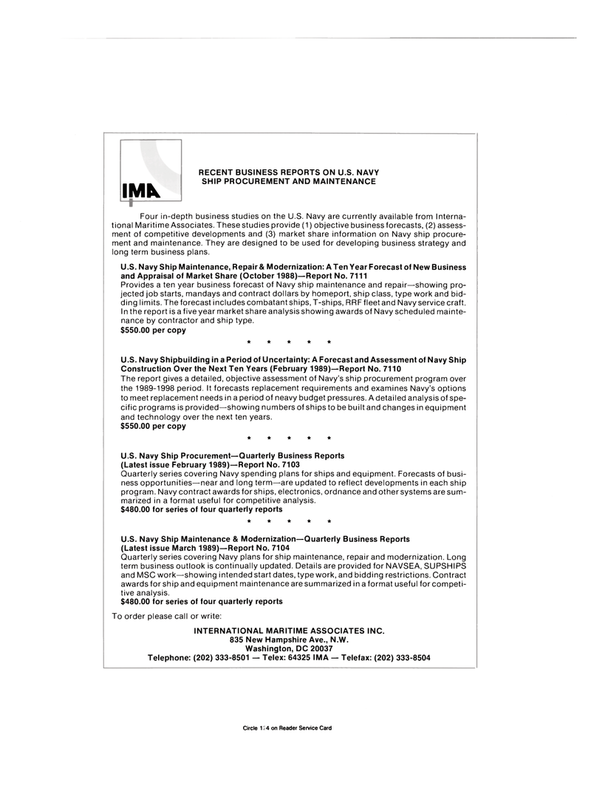 These studies provide (1) objective business forecasts, (2) assess- ment of competitive developments and (3) market share information on Navy ship procure- ment and maintenance. They are designed to be used for developing business strategy and long term business plans. Provides a ten year business forecast of Navy ship maintenance and repair—showing pro- jected job starts, mandays and contract dollars by homeport, ship class, type work and bid- ding limits. The forecast includes combatant ships, T-ships, RRF fleet and Navy service craft. INTERNATIONAL MARITIME ASSOCIATES INC. 835 New Hampshire Ave., N.W.